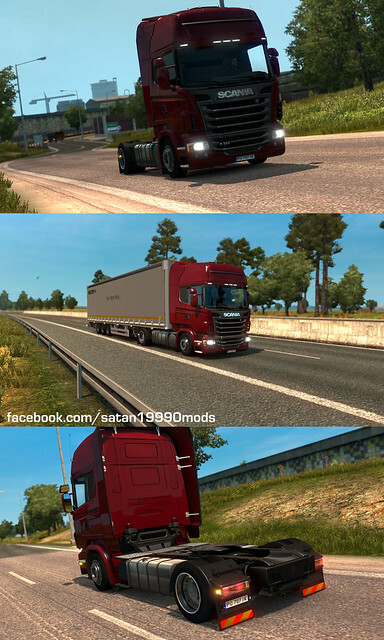 Scania - Page 4 - ETS2 - Trucks - Trucksimulator24 - Die freundliche Trucksimulator Community rund um den Euro Truck Simulator 2, Euro Trucksimulator, German Truck Simulator, 18 Wheels of Steel Reihe, Extreme Trucker und den ZModeler. Antworten im Thema: 37 » Der letzte Beitrag (Dec 1st 2016, 11:23pm) ist von Micha76. 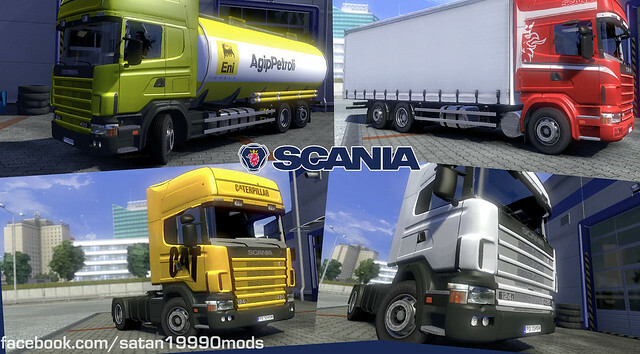 Mod added Scania 4 series, replace one of Scania R in truck dealer. 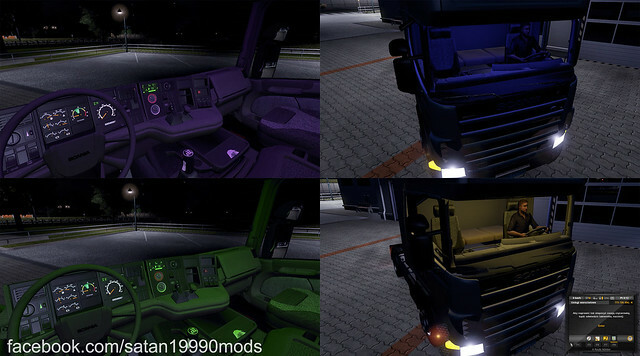 Truck have oryginal interior with animation, and advance tuning options. - Added plates TIR, ADR, G, L ect. - Fixed crash when you go to DAF dealer on 1.14.X patch. - Added a low deck type chassis, cabin specifically for this chassis and a few sets of wheels. - Changes in price of accessories, chassis, cabs etc. 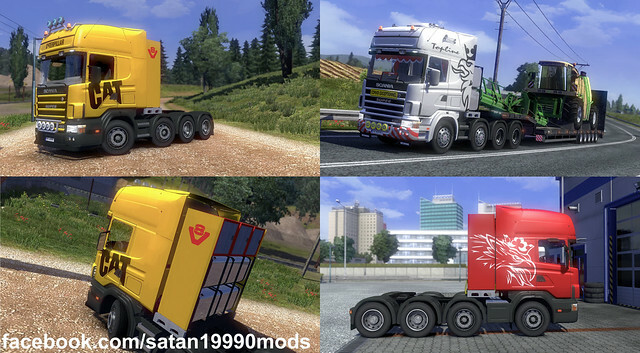 Fix muss nach Scania-Mod geladen werden! 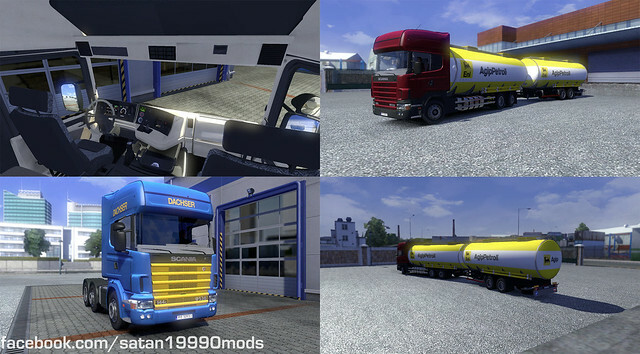 Mod added a new low deck chassis and cabs for Scania R and low deck wheels. Mod tested and working on v1.22. 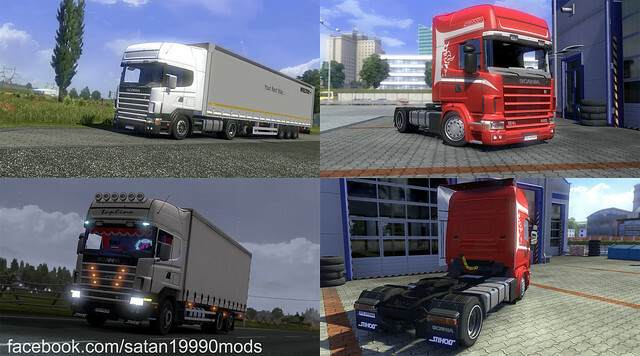 This mod adds reworked versions of Scania R-series and Streamline for ETS2. Contains a lot of tuning parts and more chassis and cabin options. Fully standalone mod, it doesn't replace anything. You can find the truck from Scania dealer. The mod is NOT compatible with OpenGL! It works only with DirectX. -4x2, 6x2, 6x2/4, 6x2*4, 6x4, 8x2/*6, 8x4/4, 8x4*4, 10x4/6, 10x4*6 and 10x6/4 chassis for all cabins. -Lowered the roof of Normal cab to make it look more realistic. -Added more door handles + optional grab handles. -All interiors (except V8 Custom) have now beige roof and rear wall (because of realism). -Some improvements and bug fixes for 5-series interiors. 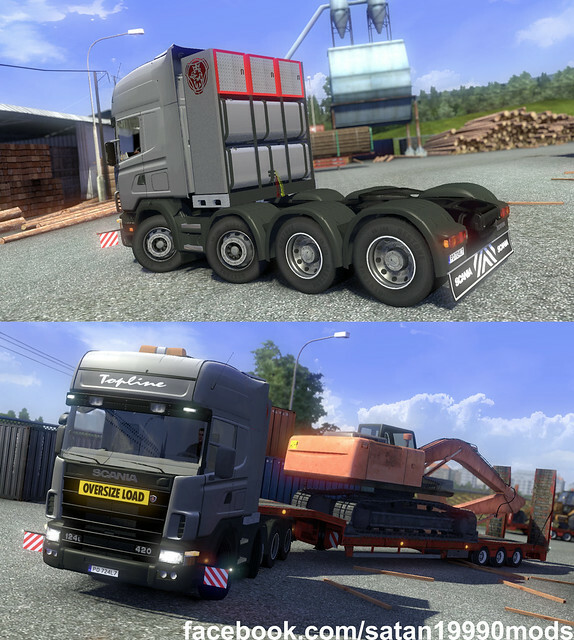 -Added retarder and lift axle indicators. -Added animation for Opticruise automatic mode selector. -Added more 9-, 12- and 13-litre engines. -Added realistic torque curves for all engines. -Added 2.71 differential (default is 3.08, but now there is optional 2.71 for use with smaller tires). -Reworked chassis frame to make it look more realistic. -Improved R2 high bumper to make it look more realistic. -Rear mounted battery box can now be removed. -Added low deck chassis (Only 4x2. I'm not going to make 6x version, no matter how many people requests it). -Added old air hose connector. -Added stock tail lamps without covers. -Added rear license plate lights. -Added a few new rear mudflaps. -Added Streamline LED side blinkers. -Added some Scania's official metallic colors. -MUCH MORE. I don't remember all changes. All my mods are free and will always be. However, if you really appreciate what I am doing and want to show me some support, you can transfer any amount of money via PayPal. I will be very grateful. Donations are voluntary. Thank you!